I love Anne because of her young, sweet innocence. She gazes at the world wide-eyed, wondering what each day is going to bring to her and she is enthusiastic about the prospects. Even though she has sad moments, they aren't really sad. What I mean by that is that she takes such delight in being morosely sorrowful, that she encourages herself in the midst of being in 'the depths of despair' by seeing how positively dramatic she can be. There is gleeful delight in her forced humility and that makes even the most dark situation seem bright somehow. You always feel like the giggles are lurking just underneath the surface and so anything good truly is a possibility. The second thing I love about the Anne books is the focus on the beauty of creation. You cannot step foot onto Prince Edward Island, physically or mentally, without being conscious of the beauty. You can feel the ocean breezes. You can hear the wind whipping through the trees. You can be almost positively sure that there really are fairies in the forest. The sunsets are brilliant. The snow makes everything serene. It is gorgeous. 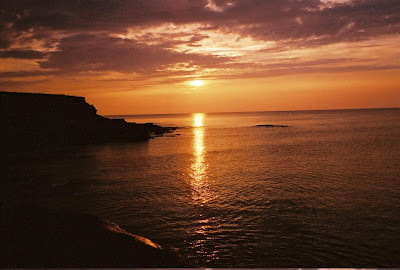 About 10 years ago I had the opportunity to visit Prince Edward Island. My friend laughed at me because I refused to get out of the car and set foot on the Island until she had run around the car with her camera to catch the moment. (Mildly reminiscent of Armstrong setting foot on the moon.) I cried when we arrived on the Island. (She thought that was funny also.) Why did I cry? Because the beauty was OVERWHELMING. I couldn't bear it. It was so much all at once. Best moment: Waking up at the West Point Lighthouse Inn in time to see the sun rise and walking on the "Fairie Path" all alone. Quiet and peaceful, this little Texas girl, familiar with dried and scorched lands, breathed in GREEN and lingered in the cool morning, underneath the trees. I will never forget that. Ever. 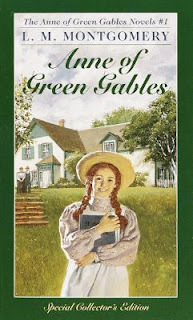 Naturally, I was horrified to discover through blogging that not many people had read the Anne of Green Gables stories. Or, if they had read that, they hadn't read much else by Montgomery (and it's all good) so I started hosting the Lucy Maud Montgomery Reading Challenge. I will be hosting it again this coming January and so I figured I'd best get a few of you going with your Anne collection. Would you like to win? I would like to give them to you! =) Just leave a comment below (U.S. Residents only, please) and I will use random.org to select a winner. If you've never read Anne, you really must give her a chance. They are perfect fall and winter fare and then I'd invite you back in January to share what you learned of Anne and her Island. Wow Carrie! This is generous giveaway. Ducking my head, I must admit, I have not read one Anne book let along any books by Montgomery. However, I would love to do so. LMM was a giftd author and had the ability to capture an audience with her unique style. About 10 or 12 years ago, I began reading that series. What a treasure! I love the Anne books and now I am currently reading the first one to my younger sisters at their request. My sisters are enjoying the story so far. I've only read the first book. The others are on my list (much like Little House for you). So, please enter me! You know how to find me. Great favorites to giveaway - I would love to win these books. How is it possible that people haven't met Anne?! I just realized when we planned our trip to Maine this summer that I'm only a day's drive from P.E.I. How could I live here a dozen years and not have known that or made the trip?! Jer. 29:11 is one of my life verses! I would love these because i also first fell in love with Anne while watching these. I had never even heard of the Anne of Green Gables stories till after i saw these. I read the whole series on a car trip when I was 16, and I have enjoyed revisiting the 1st book with my daughter this year. (I hope her dramatic tendencies can be tempered by hope someday!) Unfortunately, my paperback copies were sold in a garage sale when I was in a strangely uncharacteristic phase of purging, so I would love to own these books again. Anne of Green Gables is my most favorite also. Anne has such a knack with words, and many of them! Plus, she LOVES books! Please enter me. Thank you. I have never read the Ann of Green Gables series but I would love to. I have watched the movies and loved them. When I was a child my mom taped them off of the local PBS station during one of the many telethons. I watched them many times, but for some reason I never read the books. I would love to win. Thanks for the giveaway. I've only read the first book, and thought it was wonderful. What a great giveaway! I never got around to reading this series, but I'd love to -- it sounds wonderful :) *Thanks* for the giveaway! OH! I have a 9 year old niece that I need a Christmas present for!! This would be perfect!! These are some of the greatest books ever, and I pretty much drop everything to watch the movie versions whenever PBS airs them once or twice a year. My husband doesn't get it. This is really hard for me to admit, but I love the movies and have never read the books. I'd love a chance!! Thanks for sharing them. I agree about wanting to save The Lion, the Witch, and the Wardrobe for posterity. I could probably not say much of anything to C. S. Lewis, either. Did Montgomery reject Christianity? It's been so long since I read the books -- I remember she had scriptural allusions but I can't remember if I caught an indication of where she was spiritually herself. I'm sure I did but don't remember. I have only read the first and would love the others! My oldest Daughter would luv these books! I am excited to read all these books whether or not I win them from you. Thanks for the enlightenment! I only own Anne of Green Gables (from my tween days! ), but have read or listened to all the Anne books. Now I want to read som others of Lucy's too! 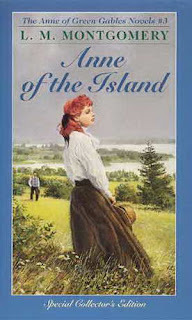 I have not read Anne of Green Gables, my daughter has, but please enter me into the contest, I would love to win them. count me in. I don't know that I've ever read these -- I loved the Emily books though! I'd love to win these to read with my kiddos. I would love to win! I've read several Anne books though certainly not all of them and it's been at least a decade since I've done so.